Rome, collection of Princess Altieri. It is not apparent who this was, perhaps Teodolinda (1876–1947) or Maria Augusta (1880–1976), sisters of the last prince of the Altieri family. Paris, collection of Jules Strauss (1861-1943; banker). Private collection. The picture was rumored to be in the free port at Geneva airport c. 1986. Paris, Musée de la monnaie, Pèlerinage (1977), cat. 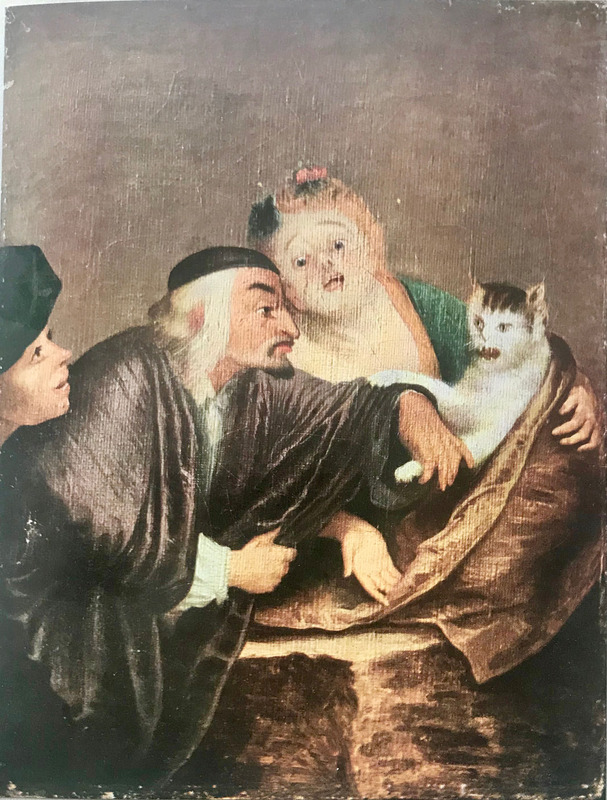 203 (as possibly by Jean Étienne Liotard, Le Chat malade, lent by a private collector). Réau, “Watteau” (1928), cat. 180. Adhémar, Watteau (1950), cat. 82. Macchia and Montagni, L’opera completa di Watteau (1968), cat. 108. Roland Michel, Watteau (1981), cat. 254. When this picture was examined in 1986, it was found to be a canvas glued on a larger canvas. It did not retain its original edges, suggesting that it had once been slightly larger. There are telling differences between this painting and the Liotard engraving. The boy’s beret lacks the folds it should have, the man’s hair doesn’t extend over his shoulder, and the folds in the drapery do not correspond to those indicated in the engraving. These and other discrepancies suggest that the painting is not as finely executed as Watteau’s original. Although Réau and Adhémar accepted this version as autograph, Mathey, Macchia and Montagni, and Roland Michel rightly rejected it. 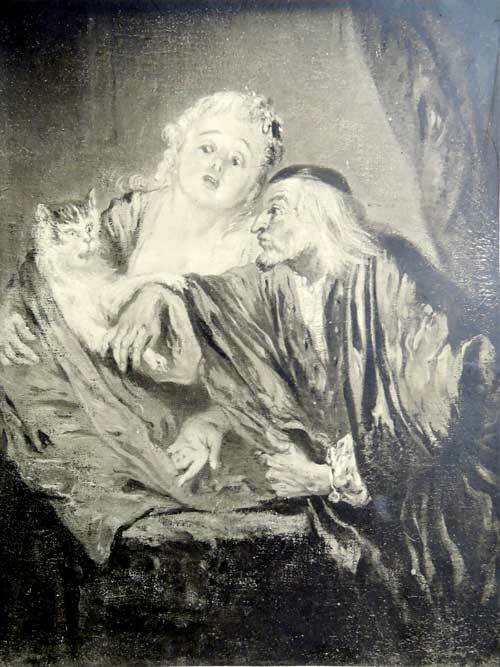 Sale, Amsterdam, March 6ff, 1769, collections of P. Yver and H. Nijman, lot 57: “Een Dame, hebbende een zieke Kat op den arm en een Dokter, die de Pols voelt; verbeeldende le chat malade, Dit Stukje is zeer fix op Doek geschilderd, door Watteau, hoog 16, breed 13 diem.” This and a pendant sold for four guilders. Although this picture was attributed to Watteau just a half century after his death, and thus might seem to have a good claim to be the authentic version, that is not the case. The annotated copy of the sale catalogue in the Frick Art Reference library has the words “door Watteau” struck though. Also, this painting and its pendant sold for only four guilders, an extremely low price. Paris, collection of Edmond-Louis-Antoine-Huot de Goncourt (1822-1896; author and critic). Paris, collection of Victor Alvin-Beaumont (b. 1862; author and critic). Hiw ownership is indicated on the verso of a photograph of the painting in the files of the Witt Library, London. There are several significant differences with Watteau’s composition. The young boy looking on has been eliminated and a curtain hangs behind the so-called doctor. The direction of this picture is the reverse of the Liotard engraving, but it seems unlikely that it was based on Watteau's original painting. In that the painting was not given to Watteau himself but was described as ”after” the master or “attributed” to him, and the two came up for sale in Paris only six years apart, it seems likely that they referred to the same painting. The first uses the Jullienne title, the second does not. However, the latter painting was said to have been engraved, and the description, howsoever garbled (the genders of the second adult and the child are misidentified), fits Le Chat malade. It is possible that this copy can be linked to our copy 1, which cannot be traced back to the nineteenth century, it cannot be linked with our copy 3 since that version lacks the child. However, without knowledge of the support and the measurements, no conclusion can be drawn.